Roman historian Pliny the Elder described opalus, the Opal, as a precious stone containing the fiery flame of Garnet, the sea green glory of the Emerald, and the resplendent purple of the Amethyst, all shining together in an incredible union. The opal is a hydrated amorphous form of silica. Submicroscopic silica spheres bond together with water and sometimes contain cristobalite and tridymire. It is defined as amorphous because it has no crystalline structure and no definite chemical composition therefore it is classified as a mineraloid instead of a mineral. 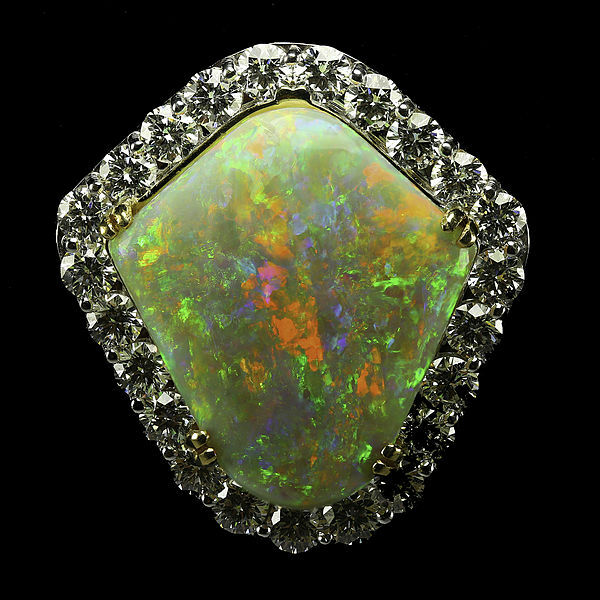 Around 80% of the world’s supply of opals is found in Australia. Next month, at the South Australian Museum, one of the rarest and most beautiful opals in the world will be public display for the first time. This 2.5 inch opal is nicknamed the Virgin Rainbow and is worth $1 million dollars. It was first discovered by miner John Dunstan in the small Australian mining town of Coober Pedy in 2003. This special opal that glows in the dark and reveals more color in darker light took millions of years to form inside in the skeleton of a belemnite, an extinct ancestor to today’s cuttlefish. As beautiful and rare as the Virgin Rainbow opal is, the honor of the most valuable opal goes to the Olympic Australis. It weighs 7.6 pounds and is worth $2.5 million. To date, it is the largest opal ever found. It was excavated in 1956 the same mining town where the Virgin Rainbow opal was found, Coober Pedy. This opal was named in honor of the Olympic Games that were being held in Melbourne, Australia at the same time. Its sheer size is not the only thing that makes it unique, it is also the purest opal found containing 99% gem opal with even color throughout. If you are in Australia, stop by the Opals exhibit celebrating a century of opal mining in South Australia opening September 25th and running until February of next year. 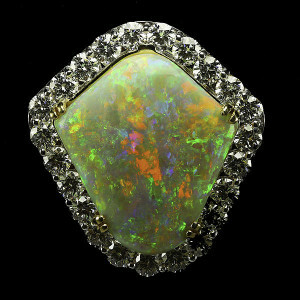 See the world’s rarest opals for yourself!